One wanders through some stories with only a vague notion of what the characters and their surrounding look like. You have a grayish, shapeless environment, peopled by grayish shapeless characters. This is definitely not so with the mystery novel Impossible Bliss. The author has a talent for visual description of his characters and their environment. This tendency for visual description may be due in part to Lee Sheldon's extensive work writing and producing for television (including work on Star Trek: The Next Generation, Probe, Simon and Simon, Quincy, Charlie's Angels and several others). Not content to leave us with simple visually interesting characters, Mr. Sheldon has filled out their personalities nicely as well. 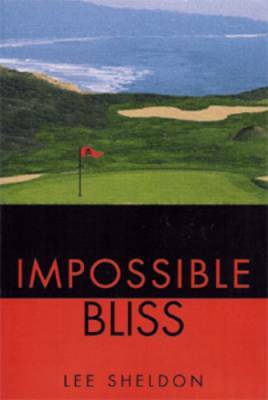 The story deals with a colorful character named Herman de Portola Bliss, who almost bares witness to a murder on a golf course near Carmel Bay, California. The murder victim seems to have disappeared, or floated away, from a sand trap. Bliss’ unique observational talents allow him to be an aid to the local police investigators, who must deal with Mr. Bliss’ idiosyncrasies while trying to solve a complicated “impossible” murder.